San Francisco de Campeche (pronounced [sam fɾanˈsisko ðe kamˈpe.tʃe]; Yucatec Maya: Ahk'ìin Pech, pronounced [aχkʼiːn˥˧ pʰetʃ]), 19th c. English also Campeachy, is a city in Campeche Municipality in the state of Campeche, Mexico—located at 19°51′N 90°32′W﻿ / ﻿19.85°N 90.53°W﻿ / 19.85; -90.53, on the shore of the Bay of Campeche of the Gulf of Mexico—and its municipal seat also serves as the state's capital city. The city's population at the 2010 census was 220,389, and the municipality for which it serves as municipal seat had a population of 259,005. 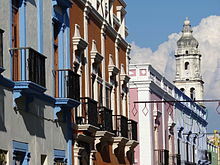 Facades of Colonial buildings with the city's cathedral visible. Founded in 1540 by Francisco Montejo, Campeche was terrorized by pirates and marauders until the city started fortification in 1686. San Francisco de Campeche was originally an indigenous village, Ah Kim Pech, where the Spanish first landed in Mexico in 1517. The city of Campeche was founded in 1540 and fortified against pirates during the 17th century. It still has the appearance of a fortress. Historical monuments and buildings, such as the Franciscan cathedral, old Maya ruins, and the old city walls and forts, attract many tourists. 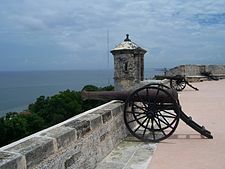 The fortifications system of Campeche, an eminent example of the military architecture of the 17th and 18th centuries, is part of an overall defensive system set up by the Spanish to protect the ports on the Caribbean Sea from pirate attacks like the 1663 Sack of Campeche. The state of preservation and quality of its architecture earned it the status of a World Heritage Site in 1999. Santiago: Used as the Botanical Garden 'Xmuch´haltún'. Reconstructed. San Francisco: Protects the Land Gate. Houses the library of the INAH. 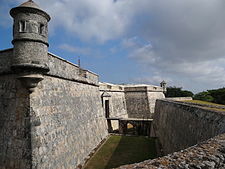 San Juan: Protects the Land Gate. Nuestra Señora de la Soledad: Also protects the Sea Gate. It is the largest one and holds the Museum of City History. San Carlos: Holds the City Museum. This fort was the first one built. Protects the Sea Gate. It also contained four gates to allow access to the main quarters. The main entrances are the Puerta de la tierra ("Land Gate"), built in 1732, and the Puerta del mar ("Sea Gate"). The Land Gate is kept as a tourist attraction, having a light and sound show three nights each week and keeping original supplies and items from the 17th century. The other gates were Guadalupe and San Román, connecting to the outside neighborhoods. Additionally, two main forts protected the city from two nearby hills on each side, the forts of San José el Alto (built in 1762) and San Miguel. These forts gave long-range artillery coverage and served also as look-outs. They were built before the walls of the city. The fort of San Miguel is used as a museum and houses a collection of pre-Hispanic items. The fort of San José houses a collection of boats and weapons of the period. As of 2010, the municipality had a total population of 259,005. The municipal seat, and largest settlement, is the city of San Francisco de Campeche (often shortened to Campeche). As of 2010, the city had a population of 220,389. Aside from the municipal seat, the municipality has 564 localities. The largest localities are, (with 2010 populations in parentheses): Lerma (8,281), Chiná (5,194), classified as urban, and Los Laureles (2,251), Alfredo V. Bonfil (2,060), Pich (1,756), Tikinmul (1,663), Imí (1,227), Hampolol (1,123), Castamay (1,101), and San Francisco Kobén (1,045), classified as rural. Campeche has a tropical savanna climate, with most rain falling in the wet season from June to October. Colonial Spanish houses in Campeche. The church and convent of San Francisco, 1540, one of the oldest in the Americas, was built on the site where officiate the first church on the mainland in 1517. Francisco de Paula Toro Theatre, (1832 - 1834). Maya stela at the Fort of San Miguel Museum. ^ "Constitucion Politica del Estado de Campeche (chapter 10, article 24)" (PDF). Archived from the original (PDF) on July 25, 2011. Retrieved August 24, 2010. ^ a b c d e "Campeche". Catálogo de Localidades. Secretaría de Desarrollo Social (SEDESOL). Retrieved 23 April 2014. ^ Centre, UNESCO World Heritage. "Historic Fortified Town of Campeche". whc.unesco.org. ^ a b "Secretaría de Relaciones Exteriores - Gobierno - gob.mx". www.sre.gob.mx. ^ "Engineering Timelines - Copenhagen key facts". www.engineering-timelines.com. ^ "Estado de Campeche–Estacion: Campeche (DGE)". NORMALES CLIMATOLÓGICAS 1951–2010 (in Spanish). Servicio Meteorológico National. Archived from the original on 18 May 2015. Retrieved 7 May 2015. ^ "Station 76695 Campeche, CAMP". Global station data 1961–1990—Sunshine Duration. Deutscher Wetterdienst. Retrieved 7 May 2015. Wikisource has the text of the 1911 Encyclopædia Britannica article Campeche (city). This page was last edited on 12 January 2019, at 23:09 (UTC).